Matt’s love of food and cooking started when he was very young, he had an interest in anything different and loved to sit in the vegetable garden and eat anything he could get his hands on. Matt came to work at Liquidity Bistro with Chef Rob Walker in 2015 and Rob nurtured Matt’s creativity by allowing him the freedom to create features and fresh sheets. 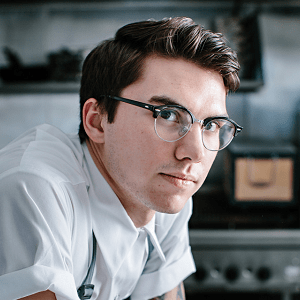 Matt has an insatiable appetite for books and learning, when he is not in the kitchen he can almost always be found with his nose in a culinary book. Matt decided to further his knowledge with travel, first to Thailand and then to Denmark, Germany, the Netherlands and Belgium. Matt worked at Relae, a certified organic, Michelin-starred restaurant in Copenhagen owned by chef Christian Puglisi. It was at Relae that Matt learned about sustainable, local, organic cuisine. He learned about caring for the ingredients, the land and the animals. Matt spent some time working on the restaurant farm called The Farm of Ideas and here his passion for fresh local organic ingredients grew to a new level. Matt has surrounded himself with a team of passionate like minded young chefs and together they will be creating sustainable, seasonal and artful plates.